I am pretty exited this happens to be the best month of the year for not only the weather is pleasant it also features my new nephew who will be us joining soon! He is going to be the youngest one in our family! Hurry up kiddo your Atya wants to see you too!! So on this special occasion we have, that is Priya of Mharo Rajasthan's Recipes and I have decided to run a new show. You may have read the previews on Priya’s Blog here. Do check it out in case you have not for the new stars. Hmm come to the point, Archana do not ramble in your old age! Bananas though an integral part of diet now many are unaware they can be eaten raw. Incidentally Alexander the Great was instrumental in bringing bananas to the west. Check this out here. Did you know? bananas had in the past had seeds in them (info source my grandpa. He had seen then and apparently the bananas were full of seeds). There are people who do eat the skin of the fruit also. That's right they eat them unpeeled. Plantains tend to be firmer and lower in sugar content than "dessert" bananas. Bananas are almost always eaten raw, while plantains tend to be cooked or otherwise processed, and are used either when green or unripe (and therefore starchy) or overripe (and therefore sweet). An average plantain has about 220 calories and is a good source of potassium and dietary fiber. Plantains are a staple food in the tropical regions of the world, treated in much the same way as potatoes and with a similar neutral flavour and texture when the unripe fruit is cooked by steaming, boiling or frying. Now you have to cook using Raw Banana or Plantain. What is it a fruit or a vegetable? You can use Plantain or Raw Banana, in any way you want fry, roast, cook But, the only thing is that Plantain or Raw Banana has to be the STAR of the recipe. Get Creative !! Please send in your entries before end of November 30th 2011. If you are a blogger, you can simply send your Name and URL of your recipe at themadscientistskitchen AT gmail DOT com with the subject of "Veggie/Fruit A Month – RAW BANANA or PLANTAIN". 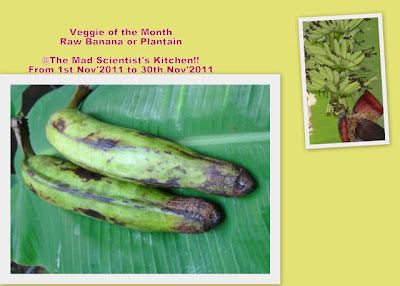 Non bloggers can email me your name, recipe and picture at themadscientistskitchen AT gmail DOT com with the subject of "Veggie/Fruit A Month – RAW BANANA or PLANTAIN ”. Link your post to this event. Use of the logo is appreciated. • I nterested in hosting it for any of the future months?Please feel free to email Priya here. Nice event and I'd like to participate. Had a doubt though, plantain can also be ripened, so when you mention plantain or raw banana, does the dish have to be made with the raw green colored plantain or could we use it's ripened form too? nice event dear..shall try participating.. Happy hosting...I've added this event in my event calender. Nice theme will try to send my entries..Happy hosting!! Vada Pav looks so amazingly delicious and mouthwatering. Excellent preparation . @Manju sorry only raw ones please.